What happens if a creature with the Phoenix Heart upgrade is destroyed by Stealer of Souls (“After an enemy creature is destroyed fighting Stealer of Souls, purge that creature and gain 1 Æmber”)? The creature goes into its owner’s hand and Phoenix Heart goes into its owner’s discard pile. “Destroyed:” abilities trigger automatically when a creature is destroyed. Therefore, the creature would return to its owner’s hand, after which Stealer of Souls cannot purge it anymore. The controller of Stealer of Souls still gains 1 Æmber from the second part of its ability. What happens if there are multiple “Destroyed:” effects on a creature with Phoenix Heart? 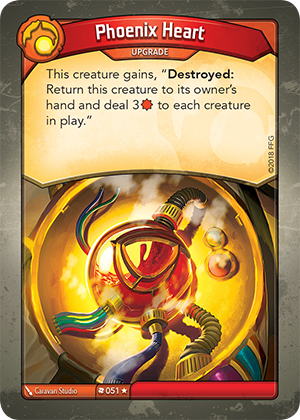 If there are multiple “Destroyed:” effects on a creature, the active player chooses the order of resolution. If I take control of my opponent’s creature with the Phoenix Heart upgrade and it is destroyed, does it go to my hand? No. When cards that changed control leave play, they always return to their owner’s appropriate out-of-play area (such as a hand, deck, archives, or discard pile). In this case, the creature would return to your opponent’s hand (and Phoenix Heart would go into your opponent’s discard pile).